Natural Tones is a simple and gentle meditation practice based on the sound theory of Nada Yoga: The Yoga of Sound. According to the ancient practice of sound healing, when an instrument such as the Tanpura is plucked, the harmonic overtones called micro tones, help bring about a shift in consciousness that promotes wellbeing and helps relieve stress. When our mind is at peace, the rest of the body will follow. 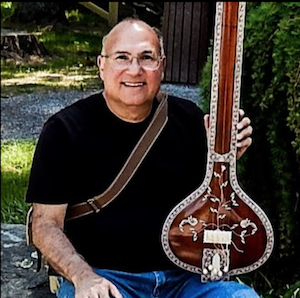 Each session is a guided meditation with a gentle Eastern sound, that John personally performs on his Tanpura, to help you relax and feel great. You take with you a relaxing experience, joy, and peace of mind. Meditation is not practiced to escape the world or environment you live in. Meditation gently introduces us back into our fast paced life, so we can live in peace and harmony. It is recommended that you consult with your primary care physician to see if a meditation practice is a helpful choice to relieve the symptoms that cause stress.